This a photograph of a typical community medicine kit. There are now twenty-six communities that Vecinos Honduras works with that have these kits. Community Monitors (Volunteers) received training in how to administer medication as local health units are short on medication and only are open Tuesday-Friday. 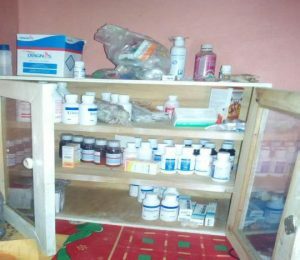 The kits are well equipped; they contain medicines to treat anemia, diarrhea, dehydration, conjunctivitis, fever, fungus, parasites, stomatitis, and scabies, among others. They also aim to prevent severe episodes of pediatric bronchitis or pneumonia. According to what the volunteers report, 165 women and 54 men, 148 girls and 156 boys have been treated in the last six months, the most prevalent diseases in the communities are fever, headache, respiratory infections, diarrhea, parasites, pediculosis, and stomatitis in few cases. Mr. Govinda from TSS accepts the plaque thanking them for their contribution. 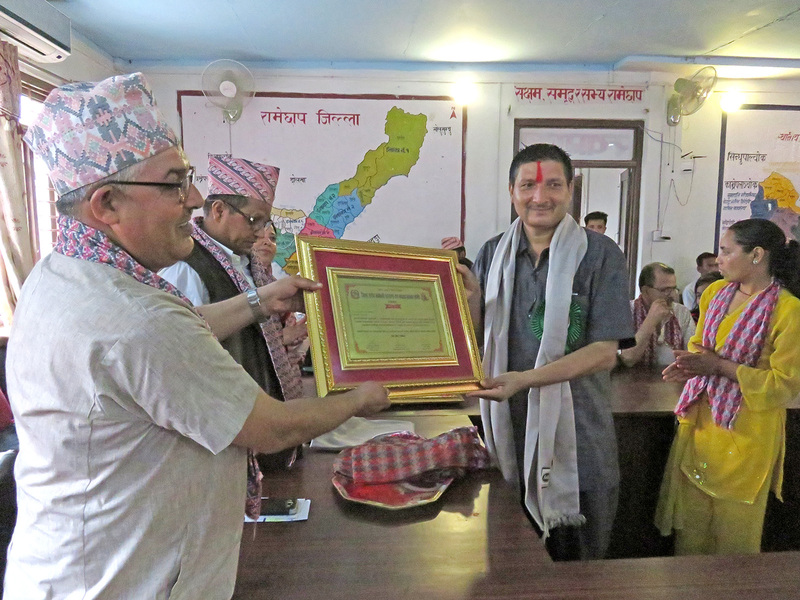 We are celebrating at World Neighbours because our partner organization, TSS (Tamakoshi Sewa Samiti) in Nepal, was recently honoured for their work to help make the Ramechhap District declared an Open Defecation Free (ODF) Zone. This was a multiyear process which involved the commitment of the community as a whole, individuals, TSS, and the local government. The progress was interrupted by politics and earthquakes but the end result spells a healthier future for the community. 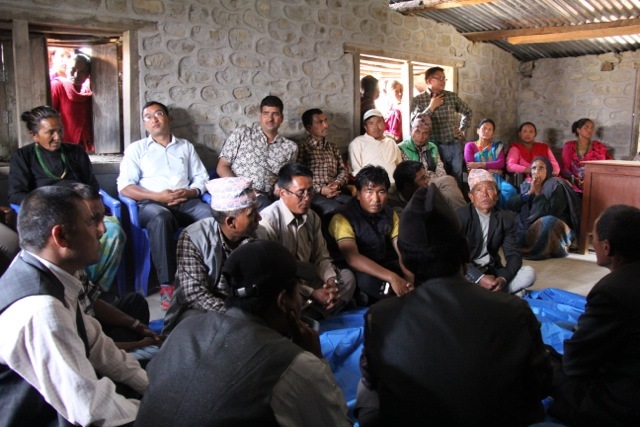 We too applaud and thank TSS for their hard work in helping the community of Ramechhap improve their own situation. TSS is one of the oldest and most respected non-government organizations in Nepal. It works in Ramechhap District (in the eastern part of the country) to alleviate poverty and help rural communities become more self-reliant. TSS helps village groups to organize themselves, manage finances, hold effective meetings, and undertake improvement projects. Their initial strategy is to establish and mobilize villagers to plan, organize, build and maintain water systems. 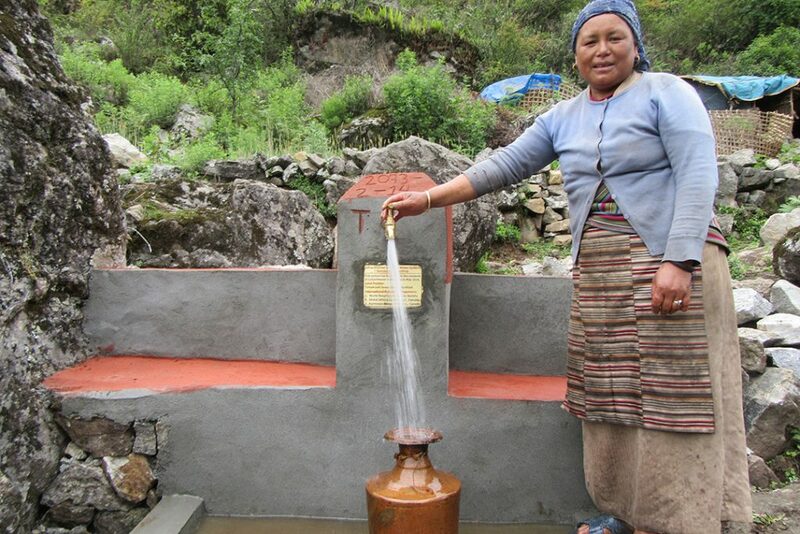 When the water systems are installed, villagers often then choose to install sealed, sanitary toilet systems, which TSS and WNC also help them with. The combination of easily accessible potable water and greatly improved sanitation systems has greatly reduced the incidence of gastrointestinal disease in Ramechhap. World Neighbours Canada, since 1989, has had the privilege of providing and facilitating financial support for the village water systems and the sealed, hygienic toilets that are all installed and maintained by local people. TSS provides only technical guidance and training, and the people themselves provide all local materials and all of the labour needed. Non local materials such as pipe, valves, cement, toilet pans and re bar, are purchased by TSS as needed, and are carried by men, women and children, from the end of the road to their remote villages. Because the villagers take ownership of the projects from the earliest stages of planning and design, and because they are in charge of long term maintenance and repair, the projects have proven to be very successful. At World Neighbours Canada we are sometimes asked what makes us unique. There are many charities that support people in developing countries; what does World Neighbours Canada do differently? The answer is multi-faceted. There are many aspects of our organization that inspire loyalty among our donors – we are run by volunteers, have very low overhead, and use modest fundraising approaches. The attribute of World Neighbours Canada that we hold closest to our hearts is enduring partnerships. These partnerships occur at multiple levels – between the local organizations we support and the rural people they serve; between us and the local organizations; and between World Neighbours Canada donors and its board and volunteers. The emphasis on partnerships is rooted deep. When World Neighbors was founded in the U.S. in the 1950s, it was ahead of its time in recognizing that poor people in developing countries deserved respect. World Neighbors founders embraced the United Nations statement acknowledging the “inherent dignity” of all people. World Neighbors evolved into an unusual organization, focusing on long-term partnerships and outcomes when many organizations worked with only a one- or two-year project term in mind. Their minimal expatriate staff – called Area Representatives – often held their positions for more than ten years, sometimes more than twenty, which was remarkable in a field where terms of more than two years were uncommon. The essence of their work was building long-term partnerships with local organizations and communities, growing leadership capacity and fostering knowledge-based development. The founders of World Neighbours Canada were inspired by the commitment and effectiveness of the World Neighbors family of organizations, and created a Canadian group to support the international network. Since its inception, World Neighbours Canada has worked to establish enduring partnerships with local organizations. We have supported Tamakoshi Sewa Samiti in Nepal and Vecinos Honduras (and its predecessors) since 1989, and APDC in Burkina Faso since 2006. Each of these organizations takes a different approach in working with local communities. Tamakoshi Sewa Samiti is committed to improving the lives of people in the district of Ramechhap. They support the building of water systems and latrines in different villages each year, and provide technical back-up for as long as is needed (nearly all of the water systems installed with TSS support continue to operate; in one or two locations, the water source has become intermittent). 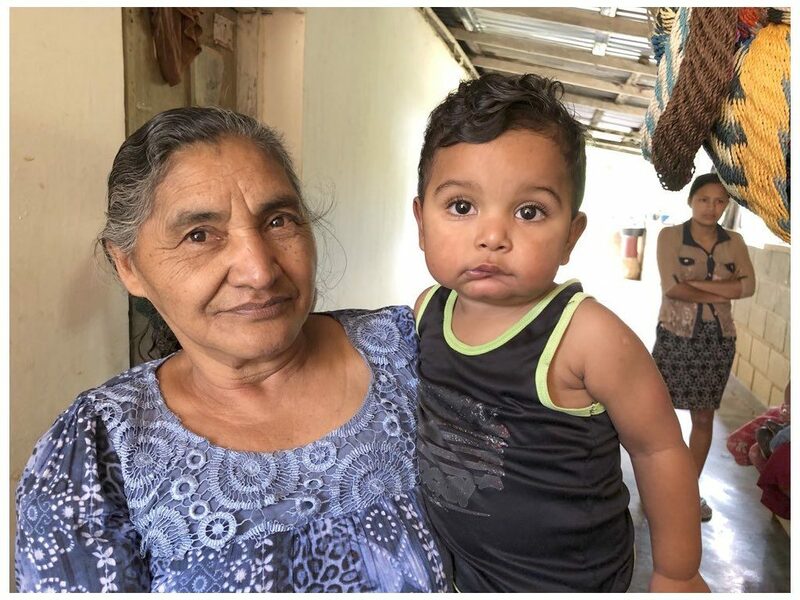 Vecinos Honduras takes a holistic approach to community development, gradually building local capacity for continuous improvement in agriculture and health. Typically, after 5-6 years they phase out intensive support, and instead provide advice to local committees or cooperatives. APDC similarly engages in a wide range of activities with villages, and shifts emphasis as local leadership takes on more responsibility. 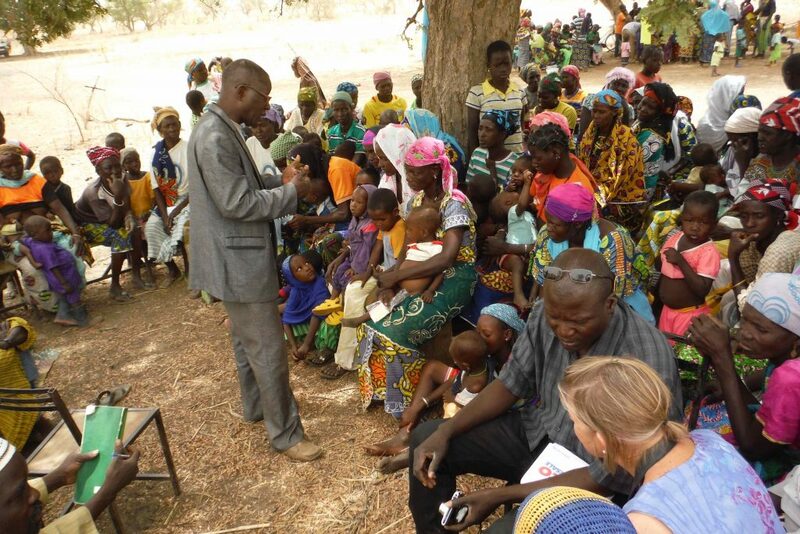 Community members are taught how to test and treat for malnutrition. Coupled with the theme of enduring partnerships is mutual respect. We respect the abilities and insights of our local partner organizations. They are led by some of the brightest and most committed people in their respective countries. Furthermore, we recognize that people who are materially poor are not bereft of ideas and ingenuity. We have the greatest respect for their ability to survive under extraordinarily difficult conditions, and to improve the lives of their families when given the opportunity and the knowledge to harness clean water, grow more crops, and raise healthier children. 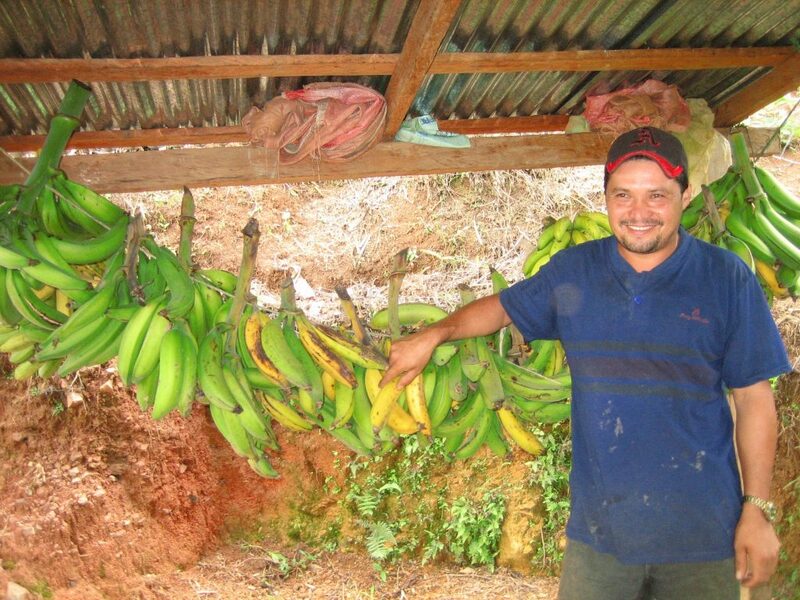 This plantain harvest will help feed the family. The following is from the British Columbia Council of International Cooperation’s website. To go their site to see this and other articles click here. Charles Tankoano had come a long way when he walked out of the chill Vancouver air and into the BCCIC office. “He hasn’t taken off his jacket since his arrival,” Judy Gray chuckled as the small group settled into their chairs. Charles had arrived from Burkina Faso, a small country in West Africa, earlier in the week. 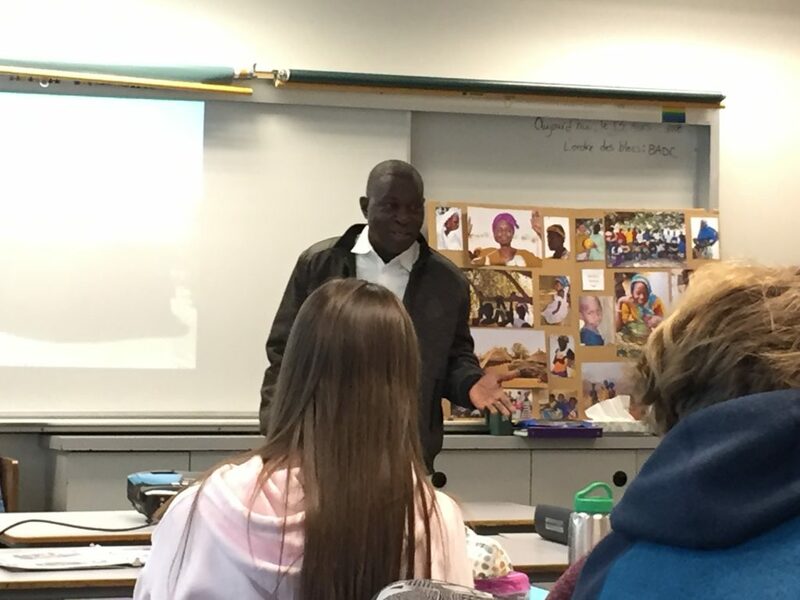 His visit to British Columbia was a whirlwind of presentations with schools, community groups, and donors of World Neighbours Canada, which, thanks to funding from Global Affairs Canada, is the partner organization that brought him over and supports his work in Burkina Faso. Charles spoke only French, requiring Judy to translate for those who did not know the language. 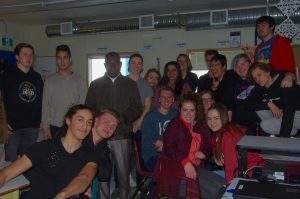 The group, consisting of Charles and 3 members of World Neighbours Canada, had come to BCCIC to use the teleconference system to hold a call with their project manager from Global Affairs Canada and a GAC International Development officer who will be travelling to Burkina Faso in the near future. As the call started up and the inevitable technical issues were mitigated, a photo slideshow appeared on the screen while Charles explained the work being done in 18 rural villages. 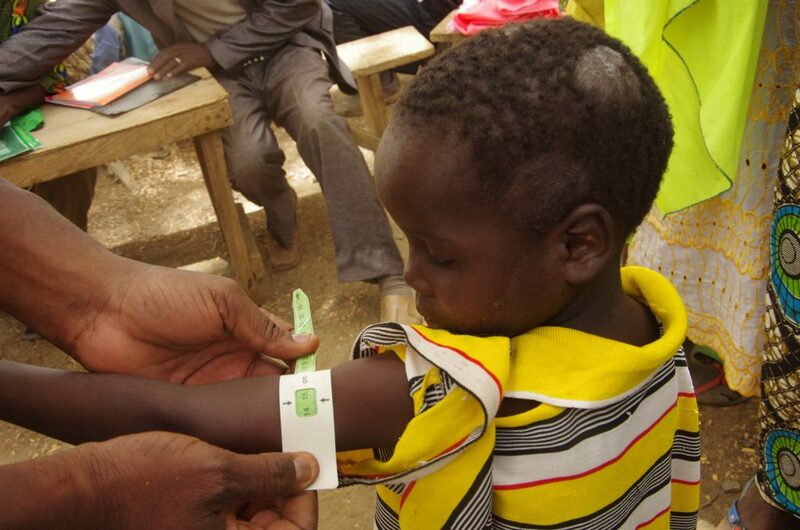 The images showed children receiving medical care, people eating together, and people working with the flat, dry land in the Fada region of the eastern part of the country. This call was a valuable connection – giving voice to Charles to share the challenges and successes of community development, and strengthening the relationship between Global Affairs and a small Canadian development organization that receives project funding. After the conference, we sat and talked a while about the organization Charles leads, called Association d’Appui à la Promotion du Développement durable des Communautés, or APDC for short. 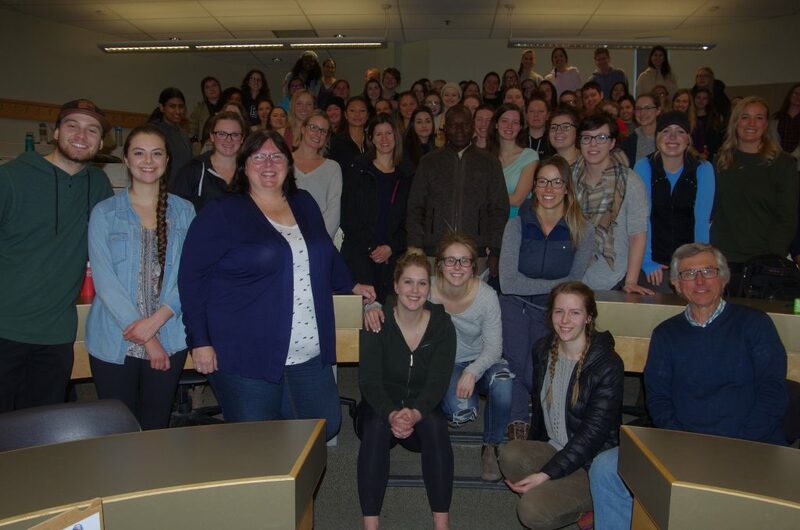 Charles explained that the organization began in 2002, with the vision of promoting sustainable and equitable development in poor and marginalized communities in Eastern Burkina Faso through capacity building of individuals and villages. The areas of focus for the projects include: food security, community health, female leadership and gender issues, environmental protection, drinking water supply, and adult literacy. Drinking water and adult literacy are addressed by APDC despite not having funding for these projects, as they realize that these two areas are critical to long term improvements. As Charles spoke it was clear that the areas of focus were all linked – working in one area will often strengthen another. APDC’s gender work is particularly compelling, and some of the earliest initiatives addressed the connection between women and the land. At the village level, APDC promoted the idea that women have the right to work a parcel of land, and have access to that plot year after year, so that she might improve the soil and benefit from the productivity. This was done in line with the national government making policy changes and providing women access to land. APDC also reinforced the notion that when men and women work together, their lives and their children’s lives are better. This is mostly achieved through information sessions with men, giving examples and working through questions that reveal truths and inequalities. Through this work the men gradually come to new understandings such as the fact that women should not be doing hard labour when they are in late stages of pregnancy, and that household work should be shared between a husband and wife. Cultural changes like these are APDC’s goal, but there is still much work to be done in this area for these ideas to be accepted by the majority of villagers. “I managed to get this great picture,” Judy said as she turned her laptop, showing a photo of a man and woman, side by side with the woman’s arm around her husband’s side. “Charles explained that 10 years ago, public demonstration of any kind of affection would not be visible or accepted. It’s a sign of progress.” Part of this progress has been enabled directly through Global Affairs Canada funding, as a Gender Consultant (local Burkinese professional) has been hired to evaluate APDC’s current gender initiatives and provide suggestions for enhancing this work. The resulting recommendations have been incorporated into project programming where possible. The improvement in gender equality often filters into benefits in other areas: improved supports for pregnant women, improved nutrition for children and pregnant women, improved environmental practices and improvements in health care. It also helps to develop a sense of community, which is an underlying foundational goal of APDC projects. Charles explained that he gained experience in development work through a few different paths. He started out studying agriculture and agronomy in the nearby countries of Ivory Coast and Niger, and he began working with the Burkina Faso government, teaching farmers how to improve soil conservation. Over time he began to find the bureaucracy of the government frustrating, and wanted more freedom to work directly on strengthening community capacity. He worked for several NGOs; in particular an NGO in Senegal, where he solidified his understanding of a participatory philosophy in development. Then, he formed his own organization to address the needs of people in his home country of Burkina Faso. When asked why he pursued such challenging work he simply explained that he had a desire to work with people who are marginalized, taking into account their own culture and respecting their values. When looking at the communities in the context of the future, the topic of climate change came up. One of the reasons for the impoverishment of the region is that the land is difficult to make productive due to less and less rain falling every year. Charles explained that though the people are mostly illiterate and uneducated, they don’t need to be told what climate change is. Living near the desert, it is already obvious that climate change has arrived: now there is only 3 months of rain per year on average, versus the 6 months of rain that could be expected in the past. The progression of climate change requires more tools for communities in these hard hit areas to be able to mitigate the effects of a warmer world – Charles explained that “the people of Eastern Burkina Faso are forgotten by the government and are being left further and further behind. More resources will be needed to mitigate the effects of climate change.” APDC is doing its best to address these challenges with simple but effective techniques, such as getting the right seeds to withstand dry conditions, creating and using compost, keeping trees to prevent erosion, and building “stone ribbons” along the fields to allow the water to soak into the soil more. These measures have already helped people to increase yields by as much as 50%. Though the challenges are still great, and change is slow, Charles has seen significant improvements for people in the region over the years. With the help of APDC, people have learned to vary production with diverse activities and better techniques, which has improved nutrition, community resilience, and environmental stewardship. More children are getting vaccinated, and women’s health is improving, especially as attitudes toward family planning shift. The improved relationship between men and women has resulted in building up the confidence of women, which is visible when women speak at meetings and there is an expectation that they will be listened to. These things together create a more hopeful picture for Burkina Faso, though it is one of the lowest listed countries on the UN Human Development Index. Charles explains that he is always in a state of self reflection, asking whether he is doing the right things, and providing the right support. He says the next project is to look at new strategies and solutions for Burkina Faso in a changing world, to push further and go the next step. World Neighbours Canada is a member of the BC Council for Global Cooperation, which is a network of global development organizations based in British Columbia, working toward sustainable development both at home and around the world. The following is part of our series featuring the community participants in the various programs we support. It is through their hard, voluntary, work that leads to sustainable change in their community. The following was written by Vecinos Honduras and translated by Mary Doyle. 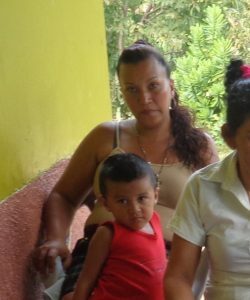 Onelba is a 34 year old woman who lives in the community of Casas Nuevas where she is dedicated to household activities. Since 2010 she has worked in community development initiating participation with World Vision in another community. In 2015 she moved to Casas Nuevas where she learned about the work of Vecinos Honduras. She began to participate in community meetings involved with training in basic sanitation issues, child growth and development, food preparation and improved stoves. In 2016 she became involved in child welfare as a volunteer health monitor and has been helping children in the community ever since. Onelba studied at school until grade nine and she enjoys participating in community meetings and training sessions to learn and experience new topics of interest. Editor’s note: A condition of our grant from Global Affairs Canada (GAC) is that an in-depth report must be delivered semi-annually. It is a Herculean task to compile all the data from these diverse projects. However, for those of us not tasked with this duty, the reports give us great insight into how complicated, varied and impressive these projects are. The following is from a recent report encompassing July 1, 2017 to December 2017, and comes in under the title “Healthy home environments and improvement” as it pertains to the Honduras projects. It is one page within sixty but gives a sense of how much is being accomplished, but also some of the challenges along the way. Coordination was made with the Ministry of Health of the municipality of Danlí (with the coordinator of the Environmental Unit) and a study was carried out to determine the technical feasibility and environmental impact of the construction of sealed hygienic toilets in the communities of Boneton and Buena Esperanza. With this coordination, a technical report was produced, which describes that the realization of the toilet project is considered technically and environmentally feasible since it will not contaminate aquifers, and it will help to ensure the reduction of diseases such as hepatitis, diarrhea and others (see details in the Construction Annex of the annual report for 2016-17). The toilet construction was approved by GAC. During the reporting period, using project funds and the contribution of families themselves, 31 household latrines were built: 9 in Boneton and 22 in Buena Esperanza. 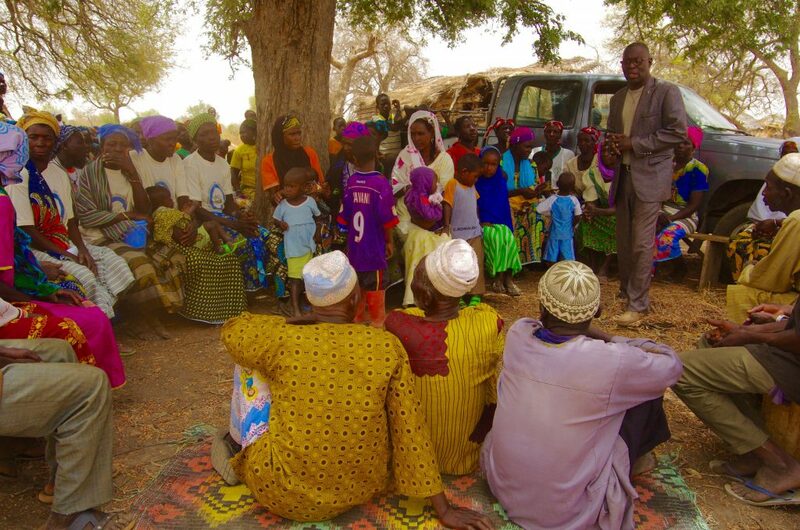 Before building the latrines, beneficiaries received training on their use and management. Five training events were conducted to raise awareness on the benefits of using improved stoves. This technology reduces indoor smoke pollution from burning of wood fuel, firewood consumption, and consequently respiratory problems. In each training event an improved stove was built. The events were developed in the communities of El Picacho, Los Encuentros, San Jose, Casas Nuevas, and Llanitos Verdes; and 58 people participated (45 women and 13 men). In addition to the 5 stoves that were made in the trainings, 20 more stoves were built. 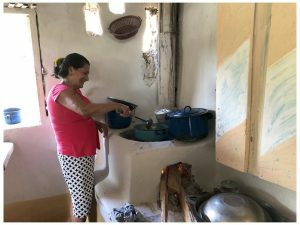 The families built the 20 stoves with an approach called mano vuelta, which consists of all the participants collaborating in the construction of 20 stoves until they finish with the last one (“I help you help me”). Three training sessions on leishmaniasis and leptospirosis prevention were conducted; 21 women, members of health committees, attended the sessions. The women implemented the preventive practices at their homes and each shared the practices with four families of their communities. As a result, four (4) families installed nylon (plastic) on their roofs; two (2) families build a fence around the house to keep animals outside the house; and two (2) families build enclosures for domestic animals. 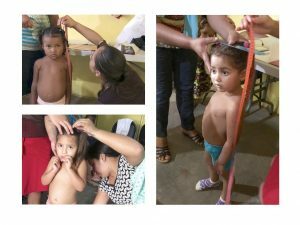 The Secretary of Health through the HU carried out diagnostic tests to detect Leishmania parasites in the community of Llanitos Verdes; 15 people tested positive and received treatment. The occurrence of the disease was the reason for developing the training. Participants said they didn’t have any knowledge about the disease; nevertheless a group commented they still didn’t believe it exists, incongruously these group had infected patients at home. Health committees conducted nine cleaning campaigns in nine communities: Matasano, Guanacastillo, Jocotal, Brasilar, Quebrachal, Lajas Blancas, El Rincon, Mal Paso and Torrecillas. The cleaning campaigns pick up trash and litter and remove standing water that could provide mosquito breeding habitat. 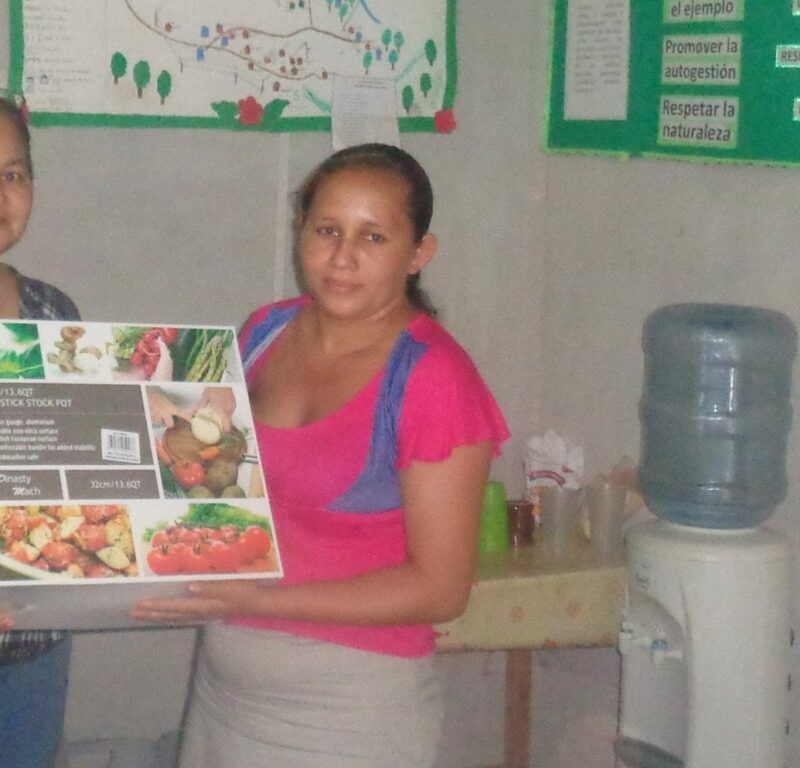 In Las Guarumas Program, a six-month training course on participatory diagnosis and project design, management, implementation, and evaluation was conducted. Six (6) health committees of the communities of Las Labranzas, Guanacastillo, Lajas Blancas, El Jocotal, Quebrachal, and El Rincon participated in the course; six men and 28 women. As training output, participants prepared project profiles for a community latrinization project because only 46% of 300 families have latrines in good condition. This training strengthened the institutional capacities of the health committees, providing them the tools to conduct a health needs assessment. 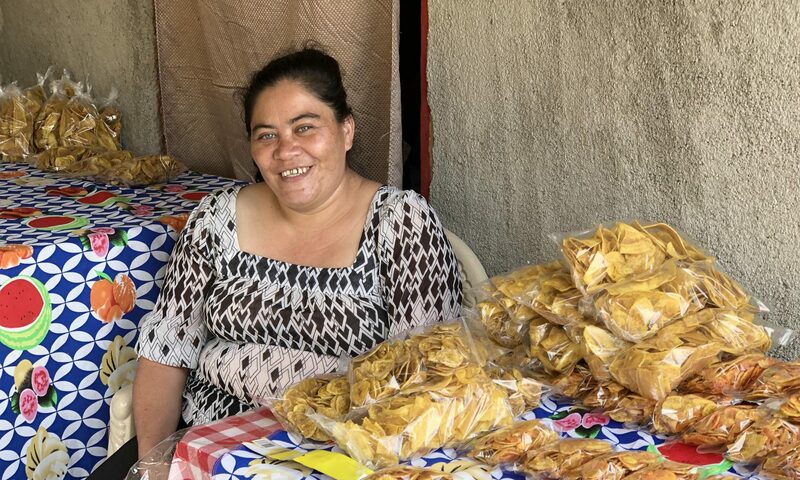 Hancys is a 28 year old woman who is recognized as one of the dedicated leaders in her community of Casas Neuvas where she participates in domestic and agricultural activities. Since 2010 she has collaborated in community development activities. In 2013 she learned about the work of Vecinos Honduras and began volunteering as a health instructor. The following year she collaborated with other institutions such as World Vision where she promoted ideas such as gender equality, leadership, health and human rights, and AIN-C (Atención Integral a la Niñez en la Comunidad) Comprehensive Care for Children in the Community (AIN-C). Hancys has studied to the ninth grade and she works to promote children living in healthy conditions where they can achieve good development and growth. She has held positions in community organizations such as parent societies and health committees. 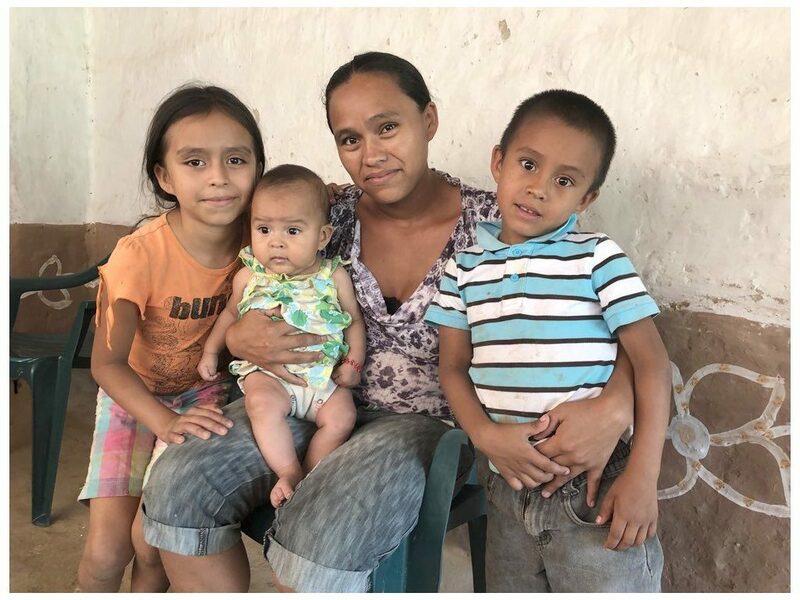 Milesi is a 29 year old leader in the community of Casas Nuevas, Honduras, where she takes part in domestic activities and, together with her husband, in agricultural activities. 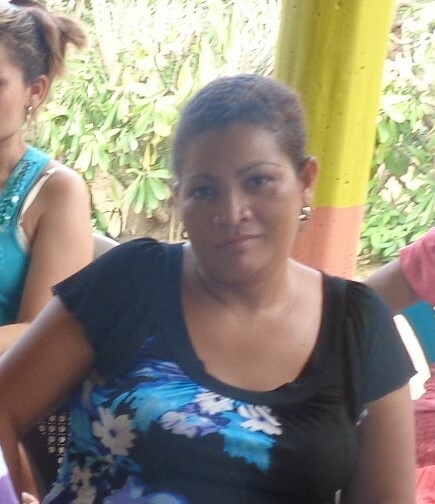 In 2013 she learned of the work of Vecinos Honduras and the following year she began training in their methodology. In 2015 she trained in basic sanitation processes, improved stoves, infant nutrition, managing domestic animals, and responsible food preparation and consumption. In 2016 she volunteered in her community as a mother mentor where she helped children achieve adequate development and growth. She studied up to the seventh grade and she likes to collaborate with her neighbours to develop her community. 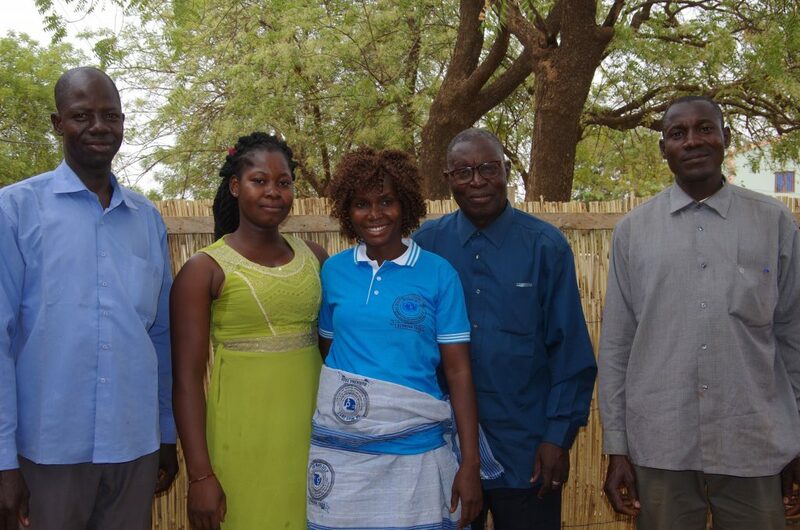 World Neighbours Canada hosted Charles Tankoano, Executive Director of the NGO APDC (Association d’Appui à la Promotion du Développement durable des Communautés) – our partner NGO in Burkina Faso, from March 8-17. In that time he traveled with one of our Directors, Judy Gray and her husband Peter, from Kamloops to Osoyoos, and then on to Vancouver. During this time he gave 17 presentations, to roughly 450 people, in 8 days. He spoke to elementary, secondary and university students (some in English and some in French) as well as several presentations to the public. He was able to conduct a video conference with GAC staff in Ottawa (thanks to facilities and support provided by the BC Council for International Cooperation). Furthermore, BCCIC staff conducted an in-depth interview with Charles and an article about him and the work of APDC will appear soon in the BCCIC newsletter. We feel that the tour was hugely successful. Charles was deeply honoured to be invited to come to Canada and share the activities of APDC. 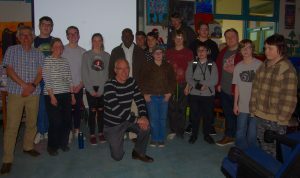 Conversely, all the groups that Charles presented to were surprised by the number of activities APDC is undertaking and felt they learned a considerable amount through the presentations about the work that GAC and WNC are supporting in a little known and extremely poor country in West Africa, namely Burkina Faso. A special thank you goes to Judy and Peter who not only played host but helped with the presentations. Judy acted as translator, as Charles only speaks French, for many of the presentations and interviews, and Peter ran the technical side of the presentation making sure the projector and slide shows worked to compliment the talk. Despite the exhausting pace, and that there was little time to recover from jetlag, we hope that Charles enjoyed his visit to Canada. Despite thinking it was very cold here he did have fantastic sunny days for traveling and a short tour around Stanley Park. He even had a bit of time for a little shopping! Charles Tankoano’s recent visit was made possible through a World Neighbours Canada Society grant from Global Affairs Canada under the Maternal Newborn Child Health initiative. We are relieved to hear that our APDC affiliates and their families are safe after the terrorist attack in Ouagadougou, the capital of Burkina Faso, March 2nd. Yesterday, a Mali-based al Qaeda affiliate, Jama’a Nusrat ul-Islam wa al-Muslimin (JNIM), claimed responsibility for the attacks. Obviously, tensions are high in Burkina Faso and we, in Canada, must wait to see how things play out. Burkina Faso is one of the twentieth poorest countries in the world. Life expectancy for men is 59 years and women 61. There are large gold deposits in the country but the majority of the population is engaged in agriculture. It is in these subsistence communities that APDC does their work.